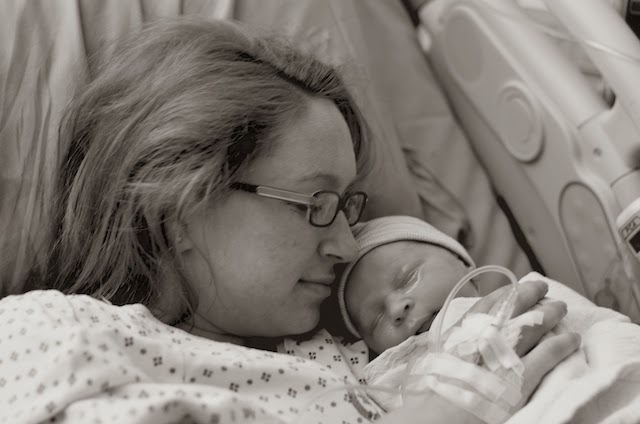 This is the story of how I become a mother to our sweet son, our Judah. This story has also been shared on The Shopping Mama here. He was born 4 days after my due date on September 12, 2013. He weighted 8lbs 5oz and was 21 inches long. They tell you every birth is different. When I had Judah I realized just how different his birth was from my daughter Ariana’s, almost 5 years ago. I’m going to say my labor first “started” on Monday the 9th of September but he wasn’t born until September 12th, 4 days AFTER my due date. On Monday, I woke up at 4 am with contractions ranging from 3 minutes to 10 minutes apart. They were bearable but definitely contractions and not the braxton hicks contractions I had been having since 20 weeks. My husband called into work and we took our daughter to school and then headed to the hospital to get checked out. They hooked me up to moniter my contractions and told me I was 2 centimeters dilated and by that point I was only having contractions every 7-10 minutes apart. They sent us home with 2 instructions: rest and walk. 12 pm on Wednesday the contractions started to get more regular and painful, every 10 minutes. My husband was at work and kept calling and checking in on me. I hated to ask him to come home since he had already missed work on Monday because of my contractions, and then the hospital sent us home. I didn’t want to get everyone too excited and have another false alarm. Finally, after lunch we talked and he decided to come home. We didn’t want me to have to drive to pick up our daughter from school having painful contractions and he didn’t like me being alone. 3 pm. We drove together to pick Ariana up. She has gymnastics on Wednesday after school so we took her to that. That was interesting. I was having contractions every 5 minutes and they were starting to hurt more. I was wanting having to lean on Richard during the contractions and hoping that nobody would notice my pain. After her class we made the decision that if they were still 5 minutes apart once we got home then we would call our friend Kate (The Shopping Mama!) and drop our daughter off to stay with her for the night. 6 pm. We got together the last few items for our hospital bag and called Kate that we were coming over! We called my mom and let her know what was going on! It was really happening and it was really hurting! Taking our daughter to our Kate’s house would mean going out of our way and after driving literally 2 minutes down the road I knew I wanted to just go straight to the hospital. So we called Kate and told her the change of plans. When we got to the hospital and handed Ariana off to Kate I was so relieved.He was finally coming! I couldn’t even make it across the cross walk from the parking lot to the entrance of the parking lot without having to stop to have a contraction. 7 pm. We got into labor and delivery and immediately were processed and given a room. I was having extremely painful contractions every few minutes. On a scale of 1 to 10 my pain level was a 7. The nurse checked me and told us that I was about 2.5 centimeters. (Side note: when I was admitted to the hospital with my daughter I came in at 7 centimeters so this shocked me to not be very far dilated. I knew this pain was different than with my daughter. It was 10 times worse and I was disappointed I wasn’t further along in my labor.) They told us to go walk around in the hospital for 2 hours to hopefully get things progressing and to eat something because if I was admitted it might be a while before we got to eat again. We agreed and walked down to the food court area to grab some Burger King. I could barely eat but I had a few bits of my chicken sandwhich, a few fries and some sips of my milk shake. I couldn’t even focus on anything else but getting back to the labor unit. Walking back was horrible. I could barely walk 10 feet without having to stop and grip the wall railing and lean over into my husband for support. My first labor was not like this, it wasn’t this bad. I was scared I wasn’t going to make it back to the L&D unit. We passed several people who looked at us with panic in their eyes asking if I was okay. I felt like my back was breaking. I was hysterical that they were going to send me home and I wasn’t having it. I told Richard repeatedly that I was not leaving until I had this baby. I even begged for a c-section just to get him out I was in that much pain. I felt like such a wimp after handling my first labor so “easily”. 8:30 pm. Walking back into the labor unit I passed another laboring mom. She was pushing an IV stand and had her hair and makeup done. She was laughing and smiling with her I’m assuming husband and friend. I’m pretty sure I glared at her. I felt like my back was going to explode and she was smiling?! I got back in bed and the nurse came in to check my pain levels. She asked the same question of “On a scale of 1 to 10 where is your pain level?” and I remember answering “9.5 when can I get an epidural” Then Dr Fuji came in to introduce himself and check me. I was only 3 centimeters dilated. What?! Only 3 centimeters, I almost broke down and cried. Contractions were coming HARD every 2-3 minutes and lasting for about a minute at a time. The baby wasn’t even moving down like he should be. They agreed that I would be staying and since I could barely even talk to answer their questions they called for my epidural and some iv pain meds in the meantime. I remember vaguely thinking I didn’t really want him to be born on 9/11 (such an emotional day for our nation) but that quickly passed, I just wanted him to be out and not be in pain anymore. 9:30 pm. Fentanyl (iv medication) was given to me and I started to feel some relief. It was almost like having a glass of wine, which was fantastic! It really took the edge off of the back breaking labor pains that were radiating through me. 10 pm. The anesthesiologist came in to administer my epidural. There is no way I could have endured hours more of that back labor. I’m telling you it was the most intense thing I have ever experienced. The anesthesiologist had a hard time finding the right spot in my back. It took 45 long minutes for her to get the epidural in place. She kept being off to the side and even hit some nerves which made my right leg feel like electricity was going through it and it jumped on it’s own. If you’ve had an epidural you know that they make you curl over your belly and arch your back and it’s not the most comfortable position while pregnant with a huge watermelon belly. In 45 minutes I had to sit perfectly still all while having contractions every 2-3 minutes. I had to keep telling myself “this is the last contraction you’re going to feel”. It was pretty hellish. It took several attempts to get it right. The nurse thankfully gave me some more Fentanyl to help take the edge off. And then finally she got the epidural in and I was able to relax some. 11 pm. Dr Fuji came in and broke my water and discovered that there was meconium in the amniotic fluidwhich mean that baby had pooped. That, of course, could cause some problems and the NICU doctor was put on standby for when I delivered. I was told that he would probably be taken right away and they would need to suction his airway immediately. He wouldn’t get placed on my belly. We wouldn’t get delayed cord cutting. These things weren’t what we had hoped for, but getting a healthy baby out of this delivery was, so we were willing to sacrifice these “little things” for the bigger picture. 3 am. I was checked again and was fully dilated. We also discovered that little mister was “sunny side up”.Meaning instead of facing my back, he was facing my stomach with his back against my back. This isn’t the ideal way to deliver a baby. It causes labor to be longer and progress slower (yep, had that) it also causes it to be more painful (yep, had that too). But my doctor with his magic hands was able to turn the baby while inside me while I was starting to push. Apparently it’s a talent that not all doctors have. 3:10 am. After about 5 minutes of pushing and with Dr Fuji successfully turning him around it was actual go time. They set the bed up for delivery with the stirrups and Dr. Fuji got gowned and everyone was ready. I had to wait a few minutes for another contraction so I could push again. He was crowning and even with the epidural I was feeling that pain and pressure. I had my husband on one side holding one leg and a nurse on the other side holding the other leg and I was ready to really push. I could really tell how well I was pushing by the emotion in my husband’s voice. It would go from counting with the nurses to “You’re doing great babe” to “He’s right there! You can do this, you’re doing awesome, keep pushing!” and that really was my motivation. I was in a zone and I could feel him moving down and out. All I could hear was my husband’s excited voice coaching me on in my ear. And then at 3:27 am our little mister was born! Luckily for me he looked okay when he first came out so they put him on my stomach. And suddenly I was in love! He was so soft and warm and wrinkly and crying and perfect. And I cooed at him and held him close and touched him all over, this beautiful little person that I made. I remember smiling up at my husband and him leaning down and kissing me with tears in his eyes. Our son was here! I only got to have him on my belly for a few minutes before they took him away to suction him because his lungs were sounding wet and they were worried about the meconium. They suctioned 18 mls of junk from his nose and throat. While they were cleaning him up and checking him out I began to get very cold and shaky. I had uncontrollably full body shaking. I also had something go weird with my blood pressure. I’m not sure if it was too low or too high or just not registering at all, but I think the nurses panicked a little because they kept saying “that can’t be right, let’s take that again”. Time and time again it must have still been wrong because they just kept taking it with a worried look on their faces and even went and got a hand pump to check it. I also spiked a 101 fever. That was a hard hour (or it could have only been 10 minutes, my time was completely squed) Laying there, feeling like I’m freezing, sweating from the fever, shaking so hard that the nurses are having to hold my legs so the doctor can stitch me up, having nurses hold my arm steady so they can try to get a good blood pressure on me. All the while my baby is over there getting his lungs suctioned out and I can’t even see him. I was so thankful that my husband was over there watching over him and looking back at me letting me know he was okay. I just wanted to scream “give me my baby”. Finally, our little mister was cleaned up, and I was cleaned up, and Daddy brought him over to me all bundled up for me to finally get to hold. Holding him made me stop shaking. It was like magic, admiring this perfect little person and getting flooded with so much love and emotion. I was given some medication for my fever and finally was starting to feel a little more in control. Everyone started trickling out of the room to give us some space to bond with our little mister. Who by the way we decided to name Judah after meeting and snuggling him. We had held off naming him until we met him. I nursed him as soon as I could and he latched right on. My labor wasn’t anything like what I expected, contractions on and off for a few days before hand, him being “sunny side up”, extreme back labor, several epidural attempts, meconium in the amniotic fluid, and with my fever and shakes afterwards, but in the end everything turned out fine and he was born healthy and now 6 weeks later we are both doing great!